The New York retailer launches a new set of interchangeable bangle accents and a new Disney bead collection from Chamilia. The collection features lovable characters and themes from Snow White, Cinderella, Winnie the Pooh, and more! 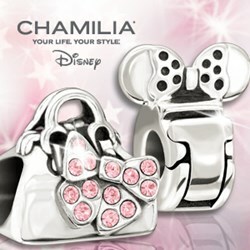 New Chamilia Disney Beads are now available at A Silver Breeze. New Disney beads include characters like Mickey Mouse, Cinderella, Snow White and Peter Pan. A Silver Breeze now offers a new set of interchangeable locks for the Chamilia bangles. The locks feature accents in colorful crystals or solid silver beads. These bangles sport an overlapping closure and two ball stoppers, to keep the beads in place. The bangles are available in various sizes (Medium to Extra-Large), starting at $70.00USD, and are compatible with all the brand’s bead collections. A Silver Breeze is also proudly launching new Disney beads to the already extensive collection, which is carried exclusively by Chamilia. The new beads include themes and characters like Mickey Mouse, Cinderella, Snow White, Peter Pan, and many more. The beads feature accents of Swarovski crystals, Cubic Zirconia, Italian Murano glass, and more. The new Disney beads are available as of August 12, 2013. They are compatible with Pandora, Troll Beads, Zable, Biagi, and most major charm bracelet brands. For more information and to purchase the new Chamilia products, please visit A Silver Breeze in store or online at: http://www.asilverbreeze.com. A Silver Breeze was founded with a philosophy in mind: give women the freedom to be themselves and embrace a sense of style that’s unique to each woman. A Silver Breeze offers women quality sterling silver jewelry that is interchangeable, from brands like Kameleon, Chamilia, and Bella Ryann. You will also find gifts and other accessories from brands like Natural Life, WeWOOD and Bering Watches. Stores are located at the Aviation Mall in Queensbury, New York and at 516 Broadway in Saratoga Springs, New York. All available collections can also be purchased at the A Silver Breeze online store at: http://www.asilverbreeze.com. A Silver Breeze ensures every customer’s shopping experience will be an unforgettable one.